Your free and accurate online printable Ruler! Printable-Ruler.net provides you with an easy to use, free printable online ruler that will save you to ever look for a ruler again! For Letter as well as A4 sized paper, inches as well as centimeters. 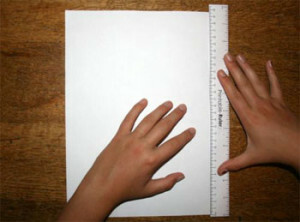 Due to the easy fold mechanism on the sides, the paper ruler can be used for measuring and drawing as well. To get your own printable ruler, just follow the print steps as explained on this page or go to the help page.